I made this bridal shower cake for my niece(by marriage)sisters Lingerie Bridal Shower. It was a 14" round cake, 4" high and quite heavy. It was a triple chocolate cake filled with bavarian cream and frosted with white buttercream. Then I cut the nightie out of black fondant with a cookie cutter, added a piped hot pink tie at waist along with edible white pearls (applied with tweezers) onto body of nightie. I piped the hanging stand and greeting with a #2 tip in black buttercream. 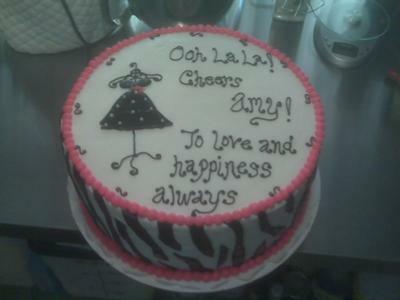 The zebra stripes are black fondant, which I rolled out and randomly cut with a pizza cutter. I applied a small amount of piping gel on backs of stripes to help them adhere to cake. The hot pink buttercream borders were piped with a #12 round tip, to form balls around the top and bottom of cake. The theme of the shower was very feminine, with all decorations in black zebra print and hot pink girlie items. The cake fit in perfectly with all the decorations and everyone loved it! Oh, and by the way, it tasted delicious! !